Westerners opposed to the application of the Islamic law (the Shari‘a) watch with dismay as it goes from strength to strength in their countries – harems increasingly accepted, a church leader endorsing Islamic law, a judge referring to the Koran, clandestine Muslim courts meting out justice. What can be done to stop the progress of this medieval legal system so deeply at odds with modern life, one that oppresses women and turns non-Muslims into second-class citizens? A first step is for Westerners to mount a united front against the Shari‘a. Facing near-unanimous hostility, Islamists back down. For one example, note the retreat last week by the Council on American-Islamic Relations (CAIR) in a dispute concerning guide dogs used by the blind. Muslims traditionally consider dogs impure animals to be avoided, creating an aversion that becomes problematic when Muslim store-owners or taxi drivers deny service to blind Westerners relying on service dogs. I have collected fifteen such cases on my weblog, at "Muslim Taxi Drivers vs. Seeing-Eye Dogs": five from the United States (New Orleans, Cincinnati, Milwaukee, Brooksville, Fl. ; Everett, Wash.); four from Canada (Vancouver, twice in Edmonton, Fort McMurray, Alberta); three from the United Kingdom (Cambridge, twice in London); two from Australia (Melbourne, Sydney); and one from Norway (Oslo). News accounts quote Muslim cabbies rudely rejecting blind would-be passengers, yelling at them, "No dog, No dog, Get out, get out"; "Get that dog out of here"; and "No dogs, no dogs." The blind find themselves rejected, humiliated, abandoned, insulted, or even injured, left in the rain, dropped in the middle of nowhere, made late for an appointment, or caused to miss a flight. Australian Human Rights Commissioner Graeme Innes and his guide dog. Innes is often denied service by taxi drivers. Islamist organizations initially responded to this problem by supporting anti-canine cabbies. The Muslim Association of Canada pointed out how Muslims generally regard dog saliva as unclean. CAIR on one occasion echoed this assertion, claiming that "the saliva of dogs invalidates the ritual purity needed for prayer." On another, the head of CAIR, Nihad Awad, declared that "People from the Middle East especially … have been indoctrinated with a kind of fear of dogs" and justified a driver rejecting a guide dog on the grounds that he "has a genuine fear and he acted in good faith. He acted in accordance with his religious beliefs." However, when the police and the courts are called in, the legal rights of the blind to their basic needs and their dignity almost always trump the Muslim dislike for dogs. The Muslim proprietor or driver invariably finds himself admonished, fined, re-educated, warned, or even jailed. The judge who found a cabby's behavior to be "a total disgrace" spoke for many. CAIR, realizing that its approach had failed in the courts of both law and of public opinion, suddenly and nimbly switched sides. In a cynical maneuver, for example, it organized 300 cabbies in Minneapolis to provide free rides for participants at a National Federation of the Blind conference. (Unconvinced by this obvious ploy, a federation official responded: "We really are uncomfortable … with the offer of getting free rides. We don't think that solves anything. We believe the cabdrivers need to realize that the law says they will not turn down a blind person.") And, finally, last week, the Canadian office of CAIR issued a statement urging Muslims to accommodate blind taxi passengers, quoting a board member that "Islam allows for dogs to be used by the visually impaired." If Westerners stick together, the Shari‘a is doomed. If we do not, we are doomed. Feb. 21, 2008 update: A nasty attack by an Australian blogger named Irfan Yusuf has appeared; his long analysis accuses me of a mistake in the caption to the picture that accompanies this column. 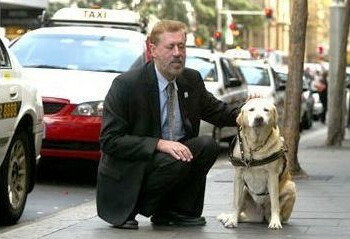 The caption, seen above, reads: "Australian Human Rights Commissioner Graeme Innes and his guide dog. Innes is often denied service by taxi drivers." Yusuf jumps on me, saying that "It is unclear how Mr Pipes reached this conclusion about Commissioner Innes," concluding that I "misrepresented" Innes. Misrepresented him? Hardly. Innes has repreatedly spoken about being denied taxi service on account of his seeing-eye dog. For starters, read here, here, and here. Further, Innes indicates that the drivers sometimes cite a religious reason for refusing his guide dog, a clear allusion to the Shari‘a, the only religious law with strictures about contact with dogs. My innocuous caption is factually correct. Yusuf's insulting blog is factually incorrect. I bother to point this out because Yusuf's screed is so typical. And to point out how sensible debate cannot proceed when the other side is hysterical and inaccurate. Mar. 28, 2008 update: For an interesting response to this article, see Omar Amine, "Lettre d'un musulman modéré aux occidentaux « modérés »." Related Topics: Council on American-Islamic Relations, Islamic law (Shari'a), Muslims in the West | Daniel Pipes receive the latest by email: subscribe to the free mef mailing list This text may be reposted or forwarded so long as it is presented as an integral whole with complete and accurate information provided about its author, date, place of publication, and original URL.